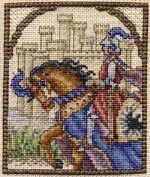 Model size: 3-1/4" x 3-1/4"
Description: This colorful miniature design features a medieval knight on horseback, all decked out in tournament finery. A moated castle can be seen in the background. The design is accented with an over-two stitched border, blending filament and beads. Background Information: This design was inspired by the work of writer/illustrator Howard Pyle: specifically his stories about King Arthur and Camelot. Stitching Comments: This design was created to be stitched over-one, with an over-two border. However, if you prefer, you can stitch it entirely over-two instead for a small pillow or a framed piece. There are 40 floss colors in the design, 2 colors of beads and some blending filament.